QED Supremus aims to be the ultimate speaker cable | What Hi-Fi? That’s where QED hopes its new Supremus cable will come into play, a speaker cable that’s crammed full of technology in an effort to set a new benchmark when it comes to doing the audio donkey work. 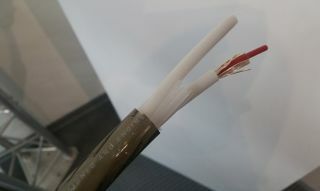 The cable has a ceramic enamel coating, a departure from more typical casing in an effort to get better insulation, uses QED's ‘Aircore’ technology, and aims to deliver class-leadingly low impedance while reducing capacitance. The QED Supremus cables are cryogenically frozen - yes, really - to a rather nippy -142 degrees, which claims to deliver performance benefits while also improving the longevity of the cable. This technique is said to be borrowed from the music industry, where a high-end cymbal might get similar treatment to both change the tonal balance and make it last longer. Also helping justify the price will be a new Rhodium-plated plug, which will come with a locking mechanism to ensure a secure connection. The QED Supremus speaker cable is likely to cost around £1000 for a 3-metre pair of terminated cables, and will go on sale around September.